My day at the Mid Atlantic Restaurant Expo proved fruitful in many ways. From tasting premium farm raised Chesapeake oysters from Choptank Oyster Company to Solid Health Drink, foie gras from Fells Point Wholesale Meats to crab cakes from The Great Gourmet it was a day of great flavor and food. 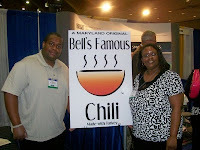 I especially liked Bell's Famous Chili which is made with turkey. The convention center housed the Restaurant Association’s annual exposition. New products and old staples filled the hall.